In 2019 business owners have to be smart when extending credit. 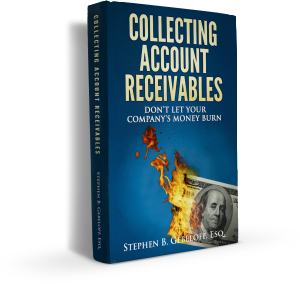 Managing your company’s account receivable is critical to maintaining a healthy cash flow. The Gebeloff Law Group is a full-service debt collection law firm. The collection attorneys at the debt recovery law firm pride themselves in helping companies set up and manage internal collection policies and procedures. Staying on top of your account receivable is critical in reducing the amount of accounts that eventually get written off to bad debt. In today’s tight economy our Florida collection attorney recommends sending a gentle reminder. If there are any signs that your customer may go past due thirty days, then a final internal demand letter should be sent to your customer, coupled with a follow-up phone calls asking your customer for a firm commitment to pay your company. Once the time to commit to paying your company has past, our debt collection law firm strongly urges that the account be placed for collection. Our collection lawyers will tell our clients, from experience, the longer you wait to start debt collection efforts, the statistics show that the rate of recovering past due account receivable diminishes significantly. Once a debt collection account is placed with our law firm, our collection attorneys will review each case with our client to devise a debt collection strategy that is in line with our client’s objectives. Some of our clients want to try and salvage a business relationship with their client. Accordingly, our law firm’s debt collection methods may vary. We invite you to call our Florida law firm and speak to our collection staff. Working together the Gebeloff Law Group and its collection attorneys will devise a debt collection strategy tailored to your company’s debt recovery needs. An Equitable Lien is one possible factor to defeat homestead protection on Florida real property. Florida has very stringent homestead laws protecting debtors from having to sell their home, to satisfy a judgment held by a creditor. Our Florida collection attorney, Stephen Gebeloff, has been concentrating the firm’s debt collection practice on assisting creditors pierce Florida’s homestead protection. There are several other factors in the debt collection process, that may be uncovered, that could allow our Florida collection lawyer to consider the appropriate motion for the Court to consider equitable principles which may fall under several exceptions to Florida’s home stead protection. Our Florida Law Firm focuses its practice on assisting companies collect money from other companies and/or individuals that may owe money. Our Florida collection lawyer recognizes that Florida is one of the most debtor friendly states in the United States. Our Florida collection attorney has devised collection strategies to pursue some of the toughest debt collection cases presented. The Gebeloff Law Group, Debt Collection Law firm, recognizes that there are alternative ways to collect from individuals who used their corporations to attempt to shield the individual from liability for paying for your company’s account receivable. By recognizing that fraud may be a factor, our collection attorney is able to assert individual liability for the debt in a debt collection lawsuit. There are collection agencies in Florida and other debt collection law firms. We have spoken in the past about the difference between a debt collection lawyer, a collection law firm and Florida collection agency. We would ask that you call our Florida debt collection law firm. Ask to speak our lawyer to discuss different collection strategies that can be put in place to assist your company collect past due accounts. Our Florida collection attorney has been getting many calls from companies that are actively trying to recover bad debt. Our collection lawyer hears time and time again that many of these companies seeking our Florida debt collection law firm’s assistance is that there were not proper internal credit and collection procedures in place at the company. To minimize the chance that an account has to be placed with either a collection agency or commercial debt collection law firm, our Florida collection attorney has authored an e-book on how to help a company set up better internal credit and collection procedures. Despite setting up credit and collection procedures, there will be times when your company will have to refer a past due account to either a commercial collection agency or a Florida debt collection law firm. Our collection attorney will be able to explain to you the differences between using collection agencies and a Florida collection lawyer to help your company recovery past due account receivable. Collection agencies are useful when it comes to high volume placements of past due collection accounts. The collection agency can send a series of collection letters demanding payment and then make debt collection calls attempting the collection of money. Remember a collection agency is not licensed to practice law. A Florida collection law firm also sends collection letters and makes collection calls demanding payment of the past due account. The Florida collection attorney then will be able to file a law suit to attempt recovery of the past due debt. A collection agency would have to refer the collection case to a collection lawyer and in turn charge your company a higher contingent fee upon collection of the money. Call our Florida Collection Law Firm and speak to our debt collection lawyer. Our Florida collection attorney has three decades of experience in debt collection. Working with your company our collection attorney will devise a debt collection strategy for your company that is just right for your company’s debt recovery needs. Collection lawyers can help your company recover bad debt. Collection lawyers are able to send demand letters to your customer making it clear that if payment is not made, the debt collection law firm may start suit to recover your money. Commercial collection agencies are not licensed to practice debt collection law. A collection agency must send the account receivable to a collection lawyer, as a result the collection agency typically charges your company a higher contingency fee to collect the past due account. A collection lawyer is able to provide your company legal strategies to attempt recovery of the debt. Collection lawyers can call your company and determine the best legal course of action to take to attempt collection of your company’s money. There are many options a debt collection lawyer can consider. Once a judgment is entered against your customer for not paying its invoices, the debt collection lawyer has powerful tools to enforce the judgment. The collection lawyer can through post judgment discovery discover assets that may be subject to garnishment and/or execution. Our debt collection law firm concentrates its practice on the collection and recovery of past due account receivable. Our collection attorney, working with your company will map out a debt recovery strategy that is tailored to your company’s debt collection needs. Our collection attorney will speak to you about your company, your delinquent customer and then together map out a collection strategy to recover the debt. We encourage you to call our debt collection law firm and ask to speak to our collection lawyer. Recovery of bad debt is the thrust of our debt recovery law firm. Our collection lawyer will provide your company with several scenarios that could happen in the debt collection process. Our collection lawyer will make clear that we can not always collect every account that is placed with our collection law firm. However, our collection lawyer working with you will provide a debt collection strategy that will give your company the best chance at recovering the bad debt. Call our debt collection law firm today. December brings the holidays and with it small business owners not only having to pay their suppliers, but also have the added pressure of having to buy presents for their friends and families. Our debt collection law firm has noticed a trend that many of the companies who we make collection calls to attempt to recover our clients’ past due account receivable overwhelmingly have the same outcome – “We really do not have the money to pay this invoice and/or open account.” Our collection attorneys have noticed that cash flow for most small businesses is on the decline making it harder for our clients to secure timely payments on their account receivable. Our collection attorney law firm believes that in most cases it takes a collection lawsuit to get the attention of your customer. Until a lawsuit is brought to collect on your company’s open account receivable, your customer may be out buying holiday presents for their friends and family, rather than paying your company on past due invoices. When it comes to collection money, our collection lawyers believe that time is not on your side. The more legal pressure that is put on your customer to pay past due invoices, the greater are the chances to recover the money due and owing to your company. A collection agency is not always the best option to collect money. When you call our debt collection law firm, you will be able to speak to our collection attorney to devise a debt collection strategy that best fits the needs of your company and takes into account the financial position of the customer who owes your company money. Collection agencies are not licensed to practice law. A collection agency can only make debt collection calls and send collection letters demanding payment. Ask us how our attorney debt collection law firm differs from a commercial collection agency. Yes, collection agencies have a purpose, but when in December collecting money is not the most wonderful time of the year, let our debt collection lawyers guide you in establishing the best strategy to help your company move into the new year with a debt collection strategy that is right for your company. Let our collection law firm help you recover ore money in the months and years ahead. Hurricane Irma has brought the Florida economy to a halt. The strain on small businesses may make it harder for your company to collect money from customers to whom you have extended credit. Hurricane Irma has caused many businesses to board up and close. This will obviously have an economic impact on everyone and may make it more difficult for your customer to make payments that are due because of cash flow issues. Once the storm clears, and things get back to “ business as usual” in Florida, it is important for your business to stay on top of their collection accounts. Our debt collection law firm is sympathetic to cash flow problems that small businesses may encounter. However, unless your company stays on top of collecting money owed to your company, your company’s account receivable may end up on the bottom of the stack of invoices your customer must pay. Our collection attorney will make demand for payment and stress the urgency that your customer make payment arrangements to pay the debt owed to your company. If payment arrangements are not made, our debt collection law firm will recommend that suit be started to collect the money. Once a lawsuit is commenced to collect the money owed to your company, if your customer is serious about paying the past due invoices, a payment schedule can be set up. The payment schedule would be filed with the court. If the customer missed a payment, your company would be able to secure a judgment for the amount owed to your company. Litigation does not always secure payment of money owed to your company. However, once suit is filed your customer should feel the urgency to get the debt owed to your company resolved. Call our debt collection law firm and ask to speak to our collection attorney. Together we will devise a collection strategy that is just right for you. Florida debt collection attorney recently performed with the Symphonic Band of the Palm Beach – Armed Forces Salute. When he is not his saxophone, collection attorney Stephen Gebeloff, manages his commercial debt collection law firm in Palm Beach County. The Gebeloff Law Group is a boutique debt collection law firm with its offices in Boca Raton, Florida. The debt collection lawyer prides himself with offering customizable debt collection strategies to his debt collection clients. As an attorney who concentrates his practice on complex debt collection matters, Mr. Gebeloff explores a wide variety of possible of legal theories that he maybe able to utilize when devising a collection strategy for your company. Collecting money from your customers is the primary goal of our debt collection strategy. Sometimes, a demand letter from a collection attorney may be all that is needed to collect on past due invoices. A letter from a collection attorney rather than a collection agency sends a powerful message that your company is serious about collecting past due accounts. When you contact our Florida debt collection law firm, Mr. Gebeloff will take the time to understand your business and make recommendations on how your company can take better control of delinquent accounts. Our firm has developed an attorney demand letter service that may be appropriate. Our collection law firm also considers officer and director liability. There are times when the corporate entity is more of a sham and is akin to the individual officer him or herself. In that case, our collection attorney will look to assert personal liability for the debt on the officer(s). When you call our collection law firm, our staff will be happy to answer your questions about commercial debt collection law. We are not a commercial collection agency. There are big differences between using collection agencies rather than collection attorneys when collecting your debt. Let our debt collection attorneys help your company maximize collect of past due accounts. 1) A Demand letter would be sent to the debtor urging the debtor to make payment arrangements directly to the creditor. The Demand Letter program is for a flat fee. Gebeloff is looking to save creditors from paying high contingent collection fees to commercial collection agencies when a Demand Letter from a commercial collection attorney may be all that is needed to convince the debtor to pay the creditor. 2) The second option adds a phone call from our commercial collection law firm. The call would be placed by a commercial collection attorney directly to the debtor. The debt collection letter coupled with a debt collection phone call from a collection lawyer will give the debtor a sense of urgency that they should consider paying the creditor before the possibility of incurring additional legal fees and costs defending a debt collection law suit. The Gebeloff Law Group again would simply charge a flat fee for this debt collection service. If the pre-litigation collection service is not successful, the creditor would then be given the option to pursue the past due collection account in the more traditional manner once the claim is placed in The Gebeloff Law Group’s debt collection litigation cue. The Gebeloff Law Group has teamed up with ScaleUp Consulting, a Miami based agency to help promote the Attorney Demand Letter program and set up technology so clients as well as potential clients can login and place their accounts for debt collection. The Scale Up Consulting team has been very easy to work with and help our commercial debt collection law firm take their vision and make the vision a reality. Call the collection attorneys at the Gebeloff Law Group to discuss all your company’s debt collection needs. We are always happy to devise a debt collection strategy that is customized for all our client’s debt recovery needs.